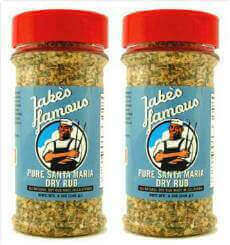 IN STOCK & GRILL READY: Jake's Famous Award Winning California Chicken Rub Tri Tip Dry Rub for Sale. 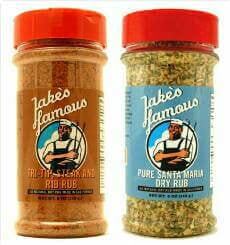 Jake’s Famous Award Winning Tri-Tip, Steak and Pork Rib Rub is the perfect pork dry rub that proves our Western heritage is alive and well with an essential blend of down home ranch style grilling seasonings. Jake's Famous California Chicken Dry Rub is the real deal when it comes to perfectly seasoned and grilled chicken. This Excellent flavor, low sodium, reduced sugar, refined spice grilling rub stands ready to deliver a bold fresh taste to all of your grilling meats. Tri Tip, Steak and Rib Rub: Pork Ribs, Tri Tip, Buffalo Cheese Parmesan Ribs, Dry rub for pork ribs, steaks, beef ribs, Herb rubbed tri tip, pork chops, pork spare ribs, chicken, fish and more. Jake's Famous California Chicken Dry Rub for sale born on the West Coast of California and continues to be a long standing regional favorite for perfect grilled chicken, fish and seafood. Two - 5 Oz containers with shake and sift tops. Recommended Best uses: Ribs, Steaks, Tri-Tip Roast, Brisket, Chicken.Tri Tip, Steak & Rib Rub & Chicken Grilling Rub contain Brown Sugar for caramelizing on meats and Chicken. Get your grill on with this special combination of grilling rub seasonings. IN STOCK & READY TO SHIP! California Chicken and Tri Tip Combo.